On the afternoon of Sunday the 25th of this month, the 40th General Meeting was officially closed by the newly-elected Chairperson Lisa Schneider. Sixteen years after the 30th GM was held in Villa Hvittorp, Finland, the EYCE returned to the venue of Kirkkonummi, Finland. Seventeen Delegates from twelve Member Organisations were present and worked hard on developing the vision, programme framework and budget for the upcoming two years. EYCE being the only pan-european ecumenical organisation for young people from all contexts, we promote our shared Christian values for a better life by giving witness of our hope and mission towards young Christians, members of church, society and politics participating in decision making processes on all levels. Motivated by common faith in God, driven by the values based on our Christian identity, we discover mutualities and respect differences in theology, spirituality and cultural traditions, as well as lifestyles. We live in a modern and dynamically changing European society where we promote justice, peace, integrity of creation and Human Rights through empowerment of young people and interreligious dialogue. We bring our member organisations closer to one another, to identify our needs and equip the members with tools and methods to develop our work. The delegates elected a new Executive Committee and equipped and mandated it to develop an action plan according to the long and short term goals of the vision. airperson, Satu Koikkalainen as Treasurer, Angelita Tomaselli, Vendula Pavlikova, Javier Hernanz Flórez and Niall Colbert. We are coming from Germany, Finland, Italy, Czech Republic, Spain and Ireland being Protestant-United, Lutheran, Waldensian, Hussite, Presbyterian and Roman-Catholic. We will have also the task of developing EYCE’s next campaign for 2017. The General Meeting decided that we will look closely at European Values in the Integration of Refugees/Migrants while paying particular attention to problems relating to religiophobia. 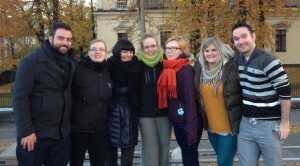 Alongside the statutory work, on Saturday, the entire group went to Helsinki centre. 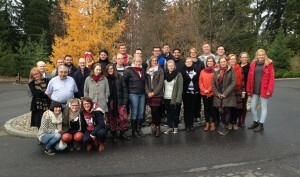 After a guided tour in the morning the delegates attended various workshops relating to EYCE’s Campaign “Break the Chains”– in numerous congregations in the Helsinki region. At the same time, the newly elected Executive Committee held an alumni meeting and lunch. Experiences and memories dating as far back as the 70s were shared and photos from the past brought a smile to everyone’s face. Later that evening, the alumni also joined the EYCE delegates at the Ecumenical Prayer in the Crypt of Helsinki Cathedral. A warm and convivial chance for discussion between the delegates and the alumni followed. 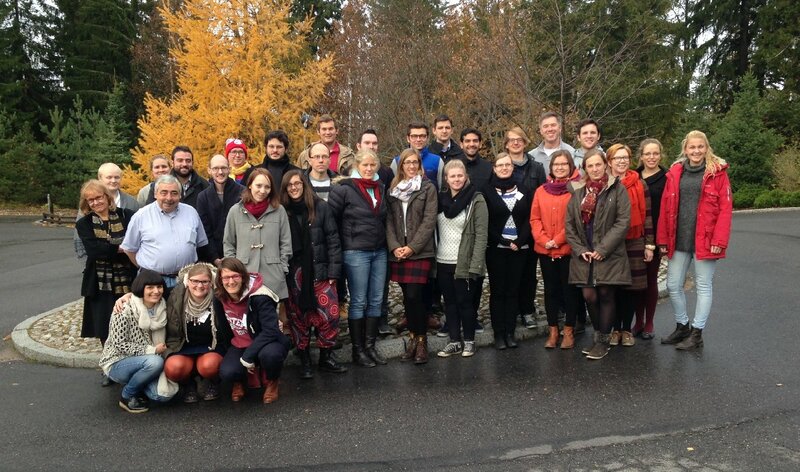 The presentations of the alumni showed the historical importance of the work of young people of the ecumenical movement in the reconciliation process back in the times of a divided Europe. This acknowledgement encouraged the new Executive Committee in its commitment and gave a special meaning to the responsibilities they took on. Social activities were also an important part of the GM. Apart from the annual International Banquet, intercultural activities and a Finnish Cultural Night were enjoyed by all the delegates. For many it was the first time in a sauna and almost all were brave enough to go for a swim afterwards in the lake… well, we did say “most”! In particular, we were very happy to welcome Jean Rehbinder, President of SYNDESMOS as one of our guests. Although there was no official agenda item in this regard it was agreed that cooperation with SYNDESMOS is desirable, especially since the Orthodoxy is not strongly represented in EYCE in general and, unfortunately, not at all represented in the Executive Committee. We would like to thank our host committee and the stewards who made the conference possible.